It was a couple of firsts from some unlikely players that helped the Guelph Storm kick off a four-game home stand with a win. 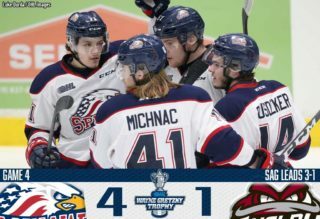 Defencemen Kyle Rhodes scored his first career OHL goal and Austin Hall netted his first of the season to help the Storm hand the Flint Firebirds their seventh consecutive loss with a 4-1 victory Sunday afternoon at the Sleeman Centre. Garrett McFadden scored a goal and added two assists and now has 11 points over his last nine games (3g, 8a) for Guelph, who have now won three of their previous four games. The Storm got straight to work on Sunday, scoring two goals in the first 3:47 of the day. Luke Burghardt potted his eighth of the season to open the scoring 2:42 into the contest. Burghardt snapped the puck past Firebirds goaltender Brent Moran’s blocker when he one-timed a centering pass from Jake Bricknell, who was behind the net. A mere 1:05 later, Rhodes scored his first OHL goal to give Guelph a 2-0 lead 3:47 into the game. 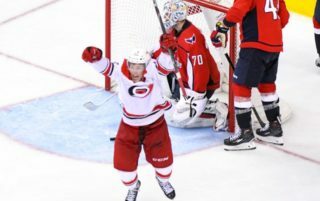 The Virginia native collected the puck at centre before skating down the right side of the Flint zone and wristing the puck high past the glove of Moran. The goal came in Rhodes’ 96th OHL game. The Firebirds would claw to within one with 6:25 to go in the period when Nicholas Caamano capitalized on a turnover in the Storm zone, skated in one-on-one with Giugovaz and slipped a backhand shot between the legs of the Guelph goaltender. However, just 27 seconds, the home team reclaimed their two-goal lead. Hall pounced on a loose puck at the top of the right face-off circle in Flint’s zone and stepped into a slap shot, roofing it high short-side over Moran’s glove as the Storm held a 3-1 lead after 20 minutes. In the middle frame, the game took a defensive turn that saw no goals scored despite the Storm hitting two posts courtesy of Rhodes and rookie Liam Stevens as the home team led in the shot department 21-12 through 40 minutes of play. The third and final period was much like the second and included a spirited fight between Guelph defender Noah Carroll and Flint defenceman Alex Peters after Peters threw a heavy hit on Stevens. McFadden would add to the Storm lead when he put the puck into an empty net with 1:10 remaining in the game as Guelph took down the Firebirds, 4-1. Final shots were 34-23 for the Storm. 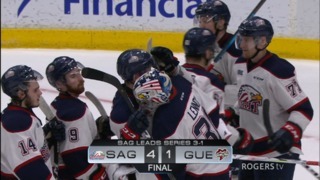 Michael Giugovaz made 22 saves in the win while Moran turned away 31 shots in the defeat. Guelph is back in action this Wednesday, January 13 when they welcome the London Knights for a rare mid-week game. 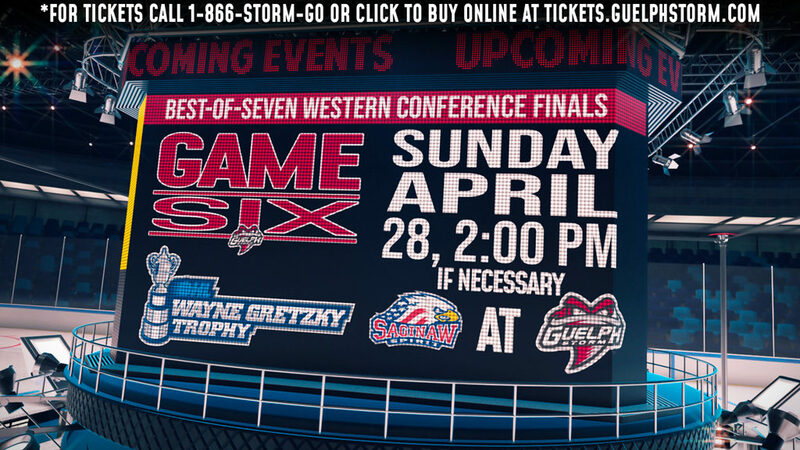 Puck drop is slated for 7:00 p.m. at the Sleeman Centre. – Tonight’s game is the third of four meetings between the two clubs this season. Guelph currently leads the season series 2-1. – With a goal and 2 assists tonight, Garrett McFadden now has 11 points in his last 9 games (3g, 8a). 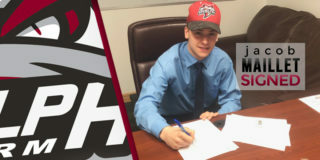 – Storm defenceman Quinn Hanna made his OHL debut. 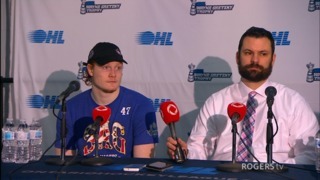 – Kyle Rhodes scored his first OHL goal. – Guelph has won 3 of their last 4 games. 1st Period-1, Guelph, Burghardt 8 (Bricknell, Carroll), 2:42. 2, Guelph, Rhodes 1 (McFadden), 3:47. 3, Flint, Caamano 14 13:35. 4, Guelph, Hall 1 (Hotchkiss, McFadden), 14:02. Penalties-Seeger Flnt (fighting), 4:22; Hanna Gue (fighting), 4:22; Kirwan Flnt (tripping), 7:00. 2nd Period– No Scoring.Penalties-Pittman Flnt (fighting), 4:07; Bricknell Gue (fighting), 4:07; served by Hotchkiss Gue (too many men), 11:48. 3rd Period-5, Guelph, McFadden 7 (Bricknell, McEwan), 18:50 (EN). Penalties-Peters Flnt (fighting), 2:58; Burghardt Gue (high sticking), 2:58; Carroll Gue (fighting), 2:58; Hall Gue (high sticking), 3:49; Reynolds Flnt (check to the head), 7:38; Deakin-Poot Gue (slashing), 19:30. Shots on Goal-Flint 3-9-11-23. Guelph 9-12-13-34. Power Play Opportunities-Flint 0 / 4; Guelph 0 / 2. Goalies-Flint, Moran 9-13-3-0 (33 shots-30 saves). Guelph, Giugovaz 9-6-4-0 (23 shots-22 saves). Referees-Sean Pindar (3), Ben Moser (37). Linesmen-Mark McLean (41), Kevin Hastings (61).